All NCC students are assigned to an academic advisor and must meet with him/her each semester during the registration period. Your advisor can assist you with developing an educational plan to meet your career goals, identify on and off campus resources to help with academic success, help with course selection and appropriate sequencing of courses, and answer your questions as they arise. The Director of Secondary Programs and Student Development is the staff position at Northwest Iowa Community College which coordinates counseling for students who are experiencing personal, academic or social concerns. The Director of Secondary Programs and Student Development makes referrals to outside agencies when needed. If you feel that you might need counsel, please contact Beth Frankenstein, ext. 242. In the absence of the Director of Secondary Programs and Student Development, the Vice President of Student & Academic Services will make the referral. If interested in receiving career assistance, please contact the Director of Learning Center. The Placement Office can help you find employment relating to your specific training, abilities, and interests both while a student and after graduation. Current full and part-time employment opportunity listings are available via email and at http://bit.ly/nccjobs. Please submit your email address and program to jobs@nwicc.edu to be added to the email list. TRIO Student Support Services is a federal grant program funded by the United States Department of Education. Its objective is to motivate, encourage, and assist students to reach their goal of graduating from their program at NCC and transferring to a four-year college. TRIO services are free and available to students who apply, meet eligibility requirements and are accepted to the program. Once accepted into the program, students are offered a variety of services including professional tutoring, academic advising, financial aid counseling, transfer assistance, college visits, career counseling, and Lunch & Learn workshops. In addition, TRIO students may be eligible for $1,000 Grant Aid Scholarships through the program ,which never has to be paid back! In order to join, students must complete an application available online or in the TRIO office. When the applications are received, students are notified as to their eligibility. Just a short walk from classes, student housing at Northwest Iowa Community College is made up of four housing complexes—Cherokee Hall, Lyon Hall, O’Brien Hall, and Osceola Hall. There is no better way to feel connected to the College and the student body than living on campus. You’ll experience college life as it is meant to be and build friendships that last a lifetime! Cherokee Hall offers apartment style living. Choose from two options; a four student apartment consists of two bedrooms, one bath, and a kitchen/living area or a two student apartment which consists of one bedroom, one bath, and a kitchen/ living area. Lyon Hall and O’Brien Hall offers suite style living. A suite accommodates four students with two bedrooms, two bathrooms, and a kitchen/living area. Osceola Hall also offers suite style living. A suite accommodates four students with four bedrooms, two bathrooms, and a kitchen living area. There is a game room in the basement that is open to all NCC students. There are several large screen TVs with gaming consoles available for use. Additional information regarding student housing is available from the Coordinator of Residence Life in Student Services. The NCC Library provides access to a wide variety of materials, information, and services that support the educational and general information needs of NCC students, faculty, staff and community residents. Personal assistance is available to individuals or small groups with research assignments within the library, by email, chat or telephone. Librarians also provide library research instruction and orientations in the classroom. The library collection includes over 16,000 physical books, 65 print subscriptions to magazines, journals and newspapers, 665 audio books on CD, and nearly 30,000 videos. Library users have online access to more than 185,000 electronic books, a variety of online databases that provide thousands of full-text newspaper, journal and magazine articles, and a growing collection of e-books and audiobooks that are available for download to computers or other devices. Access to the library catalog and online resources is available to NCC students, faculty and staff by clicking here. Registered users can reserve materials online, renew items and access their account information through the online catalog. Remote access to a majority of the online resources is available to NCC Students and employees; please contact the library staff for passwords and instructions. In addition to the resources provided by the NCC Library, students may borrow books, videos and articles from libraries throughout the state and nation by requesting interlibrary loan services. Library services include computers, two small-group study/ video viewing rooms, wireless access, internet, a copier/printer (black and white and color), a scanner and a fax machine. Students, faculty and staff may use their ID cards as their library card. Library users without a student ID may obtain a library card at the reference desk any time the library is open. We proudly supply the academic community with tools for the mind. Visit the newly remodeled NCC College Store for all your book, apparel, and accessory needs. The NCC College Store, located just around the corner when you walk through the main entrance of Building A, provides students with all the tools they’ll need to be a student at NCC. Northwest Iowa Community College students trust the NCC College Store for new and used textbooks. We offer you personalized help in choosing your textbooks for your classes. At the NCC College Store you’ll get the exact textbooks selected by your instructors at the most competitive prices…guaranteed! The NCC College Store is dedicated to supplying our students with as many used textbooks as possible! Stop in or call the College Store for used book availability. When purchasing textbooks the student will need their “My Class Schedule”, which can be printed from the student’s account on WebAdvisor. The “My Class Schedule” document needs to be presented to the College Store personnel before the student will be allowed to purchase textbooks. Textbooks can be purchased with credit card, check, cash or financial aid. If using financial aid, you must present your NCC Student ID with your “Class Schedule” to access your financial aid account. Financial aid can also be used to purchase office supplies, flash drives, backpacks and any other items needed for your courses. Your NCC College Store has more than just books. 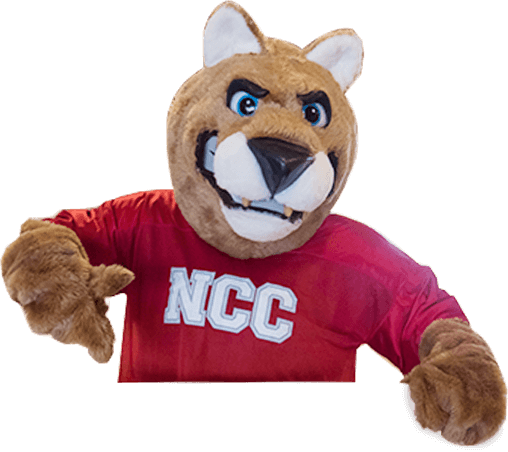 We have NCC sweatshirts, t-shirts, pants, hats, chap stick, tissues, cough drops, nursing supplies, stamps, safety glasses, school supplies, book bags, mugs, NCC novelty items, gift certificates, wireless mice, ear buds, headphones, I-Pad covers and much more! For your lunch or snack needs: the College Store offers a full line of potato chips, candy bars, snack items, pop, breakfast and regular pizza, hot sandwiches, burritos, coffee, cappuccino, hot chocolate, F’real ice cream shakes and more! Ask about our value card: Pay $20, but it is worth $22 in trade! Questions about the College store? Call 712-324-5061 or 800-352-4907 ext. 320.